After capturing many clusters I wanted to switch to more interesting objects, which would test the quality of the skies on Milos, therefore I slewed my portable newton telescope to probably the most famous galaxy – Andromeda. During the post-processing I was astonished how many details were revealed after such short integration time. I would not be able to capture such picture from home, even if I would use any light pollution filters and much longer integration time. Brief description of the galaxy: Andromeda is our galactic neighbor and it is approximately 2.5 million light-year from Earth, but it is approaching (110 km/s). There are estimates that our Milky Way and Andromeda will collide, but we still have some time, because it should occur in 4.5 billion years. Andromeda has diameter 220 thousand light-years, which makes it twice bigger than our own galaxy Milky Way. 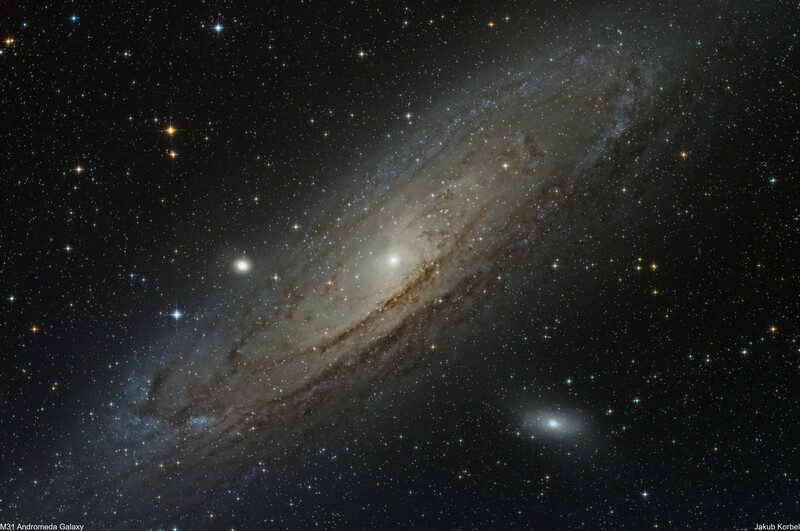 Two clouds surrounding the main galaxy are dwarf galaxies M32 and M110.